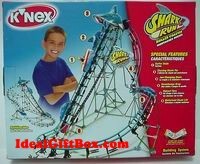 Build big and catch a wave with the awesome Shark Run Roller Coaster! This real-working coaster builds over 4 feet long and features a motorized chain lift to carry the surf-themed car to the top of the track. At the peak, watch out for the chompin' shark tunnel, then ride the rail down and around for some fast-paced coaster action! Requires 2 AA batteries.